Computta Is One Year Old! Yes, Computta is finally ONE YEAR Old! Ta-Daaa!! We are excited to let you know that we are now one year old and happy aboout it. We started this free service in the summer of 2017 and never loooked back. Growing fast, changing, improving, adapting – all with full support from our awesome users – you! So do we have a Birthday Gift for you today? Yes we do and this gift can easily be worth more than a quarter of a million! Yeah! 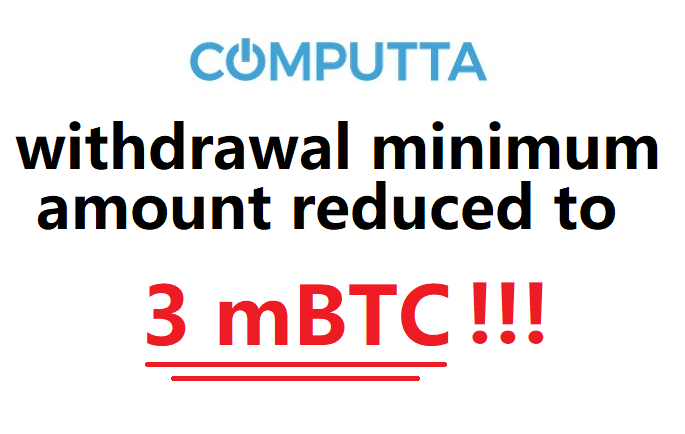 So those of you who ran Computta app for a while and still were not able to reach the min, rejoyce, you can wiithdraw now! From now on the payment button will be activated when you reach 3mBTC in your balance. If you are happy, go watch our little birthday video on our FB page and share your likes, thoughts and congratulations with us. Hapy birthday dear Computta, happy birthday to youuu!! That’s all for today, folks. As usual If you have any questions or concerns re anything related don’t hesitate to let us know either on our helpdesk or on our FB page. Thanks again for being with Computta!